Despite spring starting a few weeks ago the golf course is still waiting to wake up. The cold spring weather has kept us dormant much longer than the previous two seasons. Looking forward the weather is finally going to warm up, but we don’t know if that will last. I’m hoping to see green grass by the end of April. The course is wet due to a lot of recent rainfall and some wet snow. 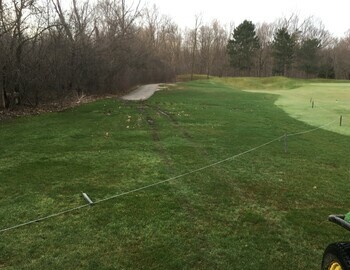 In order to try to keep the course as nice as we can during wet and dormant conditions we ask that golfers please obey cart signs, stay on paths where possible, and keep carts far away from roped off areas. The reason we put ropes up in certain areas is to either relieve the turf from too much traffic or to keep carts out of areas that are so wet carts would either get stuck or leave very ugly muddy ruts (as seen in this picture). If a rope or rope stake is in the way of your shot and you take it down to hit, please put it back up. We always try to keep our greens as nice as possible for the golfers. Golfers enjoy smooth putting surfaces even when the grass is still mostly brown. Because of this we have mowed them three times already this year and have moved the hole locations a couple times. Golfers can help out by making sure to repair their ball marks. I’m excited for another good season, once the weather allows it to start.